Y aquí un disco que publico no porque me guste (demasiadas baladas y boleritos para mi gusto) sino porque simplemente se relaciona con el anterior posteo. No es de extrañar que la Tierra del Sol, una colección de baladas mexicano por escrito por tres de Mexico más prominentes compositores modernos, es otro capítulo de Charlie Haden continuamente desarrollando la biografía musical. Haden se dio una carpeta de canciones por el difunto y legendario compositor mexicano José Sabre Marroquín por su hija como un agradecimiento por su grabación de "Nocturno". Haden fue más de las canciones y decidió grabar algunos de ellos, se dirigió a ellos pianista Gonzalo Rubalcaba, por organizar, contrató a un grupo estelar, la Tierra y del Sol es el resultado final. ¿Qué resultado. Hay ocho composiciones de cada uno y Marroquín por Agustín Lara y Armando Manzanero, en su propio derecho y prolíficos compositores venerados que se han registrado en este país por Presley, Sinatra y Bennett, por nombrar algunos. El grupo reunido para este proyecto es estelar - Joe Lovano, Ignacio Berroa, Rubalcaba, Miguel Zenón, Oriente López, Larry Koonse, Lionel Loueke, Michael Rodríguez, y Juan De La Cruz. Rubalcaba las cartas de no transformar las canciones en música de jazz, sino más bien convertirse en una entrada para la improvisación melódica, rítmica invención, interacción y de grupo. Rubalcaba línea frontal de la interacción con Lovano, Zenón, y Rodríguez - en especial sobre "de siempre" - es emocionalmente honestos y musicalmente inspirador. "Nostalgia", introducido por la guitarra española, percusión y piano, es una maravillosa melodía springlike agridulce envuelta en un ritmo lánguido y punzante en primer lugar por Rodríguez y, a continuación, Zenón, antes de hacer flotar las guitarras detrás adentro Lara "Solamenta una Vez" es arreglos para trío aquí. Rubalcaba del solitario, con su cambio de ostinati y alternando cuerdas y una sola nota se ejecuta, es impresionante. Lovano del lirismo de "Esta Tarde Vi llover", de Manzanero, se juega en su mejor Ben Webster. Con el trabajo de pincel skittering Berroa, Lovano acentos de la melodía similitudes con "Un beso es sólo un beso" que antes de pasar a Rubalcaba, que extrapola la armonía y lo abre en contra de De La Cruz de los bongos. La tierra del Sol es un álbum muy romántico, pero es exuberante ornamentación o artificiales, sin afectación. Musicalmente, su refinamiento es tal que suscita críticas ocasionales, así como de escuchar. Esperemos que esta no será la última de este ejercicio Haden y Rubalcaba, pero una introducción. 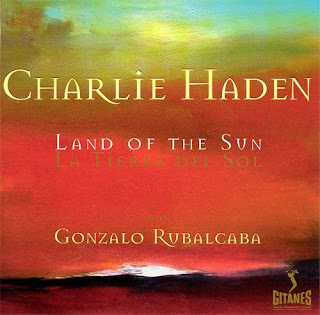 It should come as no surprise that Land of the Sun, a collection of Mexican ballads written by three of Mexico's most prominent modern composers, is yet another chapter in Charlie Haden's continually unfolding musical biography. Haden was given a folder of songs by the late and legendary Mexican composer José Sabre Marroquín by his daughter as a thank-you for his recording of "Nocturnal." Haden went over the tunes and decided to record some of them; he turned them over to pianist Gonzalo Rubalcaba for arranging, employed a stellar band, and Land of the Sun is the end result. What a result. There are eight compositions by Marroquín and one each by Augustín Lara and Armando Manzanero, in their own right prolific and revered songwriters who have been recorded in this country by Presley, Sinatra, and Bennett, to name a few. The band assembled for this project is stellar -- Joe Lovano, Ignacio Berroa, Rubalcaba, Miguel Zenón, Oriente Lopez, Larry Koonse, Lionel Loueke, Michael Rodriguez, and Juan De La Cruz. Rubalcaba's charts don't transform the songs into jazz tunes, but rather become an entryway for melodic improvisation, rhythmic invention, and group interplay. Rubalcaba's front-line interaction with Lovano, Zenón, and Rodriguez -- especially on "De Siempre" -- is emotionally honest and musically inspiring. "Nostalgia," introduced by Spanish guitar, percussion, and piano, is a wonderful springlike bittersweet melody wrapped in a languid rhythm and made poignant first by Rodriguez, and then Zenón, before the guitars waft back in. Lara's "Solamenta una Vez" is arranged for trio here. Rubalcaba's solo, with its shifting ostinati and alternating chordal and single-note runs, is breathtaking. Lovano's lyricism on "Esta Tarde Vi Llover," by Manzanero, is played in his best Ben Webster. With skittering brush work by Berroa, Lovano accents the tune's similarities to "A Kiss Is Just a Kiss" before turning it over to Rubalcaba, who extrapolates the harmony and opens it up against De La Cruz's bongos. Land of the Sun is a deeply romantic album, but it is lush without artificial ornamentation or affectation. Musically, its refinement is such that it begs critical as well as casual listening. Hopefully this won't be the last such exercise from Haden and Rubalcaba, but an introduction. Surprising as it may seem, Charlie Haden, who shook jazz's foundation playing bass in Ornette Coleman's first quartet, is now recording Latin American lullabies. With 2001's Nocturne he consummated his love affair with the bolero, teaming with pianist Gonzalo Rubalcaba, drummer/percussionist Ignacio Berroa and several guests (including Pat Metheny and Joe Lovano) on a rigorously mellow set of Latin ballads. Now, after detouring with the puzzling American Dreams in 2002, Haden offers chapter two of his bolero book, Land of the Sun, a study in muted, calming colors, silky-smooth tempos and cascades of pure melody. Haden achieves a greater rhythmic and tonal variety here than on Nocturne, but as before, he can be repetitive and, at times, overly sweet. Compared to Nocturne, Land of the Sun has thicker orchestrations and more solos per song. There are four horns, deployed in various combinations. Joe Lovano returns for several meaningful cameos, including "Esta Tarde Vi Llover (Yesterday I Heard the Rain)" an Armando Manzanero piece that Claudia Acuna devoured on her latest MaxJazz release, Luna. Miguel Zenon, an ambitious composer in his own right, plays written parts and several searching alto solos. Trumpeter Michael Rodriguez and flutist Oriente Lopez create a wonderful sonic blend on "Cancion de Cuna a Patricia (Lullaby for Patricia)" and "Cuando Te Podre Olvidar (When Will I Forget You)"; both solo with poise on the concluding "Cancion a Paola (Paola's Song)." Pat Metheny doesn't appear on this album, but guitarists Larry Koonse and Lionel Loueke capture something of his spirit. "De Siempre (Forever)," like "Nocturnal" and "El Ciego" from Nocturne, has an ahead-of-the-beat push that sounds utterly authentic; this is dance music, after all, and Haden and friends convey an infectious sense of momentum. The core trio shines on the no-frills "Solamente Una Vez (You Belong to My Heart)," but this only accentuates the fluff factor of the next track, "Nostalgia." For all his avant-garde credentials, Haden has long been devoted to "the art of the song," to cite the title of his 1999 release with Quartet West. One can draw a straight line from his Ozark folkie roots to his disarmingly straightforward duets with Metheny, Hank Jones and many others. A lover of undisguised melody, Haden is a musical populist, eager to connect with his listeners. Marroquin's attractive songs are a good bet in this regard. Haden is also a political animal, and his convictions have led him to shockingly disparate places, from the adventurous work of the recently revived Liberation Music Orchestra to the treacly rendition of "America the Beautiful" on American Dreams. Haden intended the latter not as facile patriotism, but rather as a paean to an ideal America of the left-wing imagination. As he recently told Mark Miller of Toronto's Globe and Mail, "If the country could be the way the founding fathers wanted it to be, we'd be well-liked all over the world, and 9/11 would never have happened." This is naive at best, and if muddled thought makes for muddled music, no wonder "America the Beautiful" fell as flat as it did. The understated, apolitical Land of the Sun is a gem in comparison. 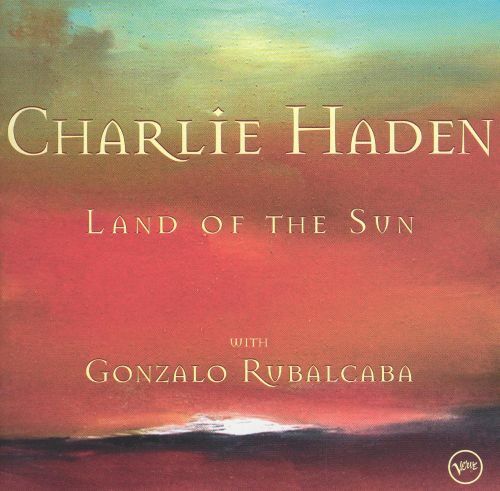 Most people would be hard pressed to describe Charlie Haden as a Latin Jazz musician, but that doesn’t change the fact that Land of the Sun was a beautiful journey into music full of lush harmonies, intoxicating melodies, and roots in Central America. Haden had shown many sides to his musicianship at this point in his career, from free jazz bassist to politically charged band leader, but through it all, he was always an appreciators of great music. In this case, he found a mother load of gorgeous compositions in the work of Mexican composer José Sabre Marroquín. An influential composer and conductor, Marroquín created a vast body of work that spanned between classical music, jazz, film scores, and more. Haden had already utilized a Marroquín composition on his album Nocturne, but on Land of the Sun, he put the spotlight brightly on the composer with eight songs. He rounded he album out with single contributions from Mexican composers Augustín Lara and Armando Manzanero, delivering a repertoire of solid songs. With a solid foundation of potent composition from some of Mexico’s finest composers, Haden built an outstanding project with a core of strong musicians. Gonzalo Rubalcaba, who at this point had been a long time Haden collaborator wrote the arrangements, sharing his experience with the genre and potent musicality with the project. Drummer Ignacio Berroa provided the rhythmic foundation with some occasion help from percussionist Juan Del La Cruz; Berroa provided not only the perfect connection to both bolero and jazz rhythms, but brought the proper amount of restraint and taste which allowed him to support and color the project. Cuban flautist Oriente Lopez brings a gorgeous tone, a deep understanding of the rhythmic foundation, and the ability to nimbly move through jazz changes. Puerto Rican saxophonist Miguel Zenón would soon display the same type of heady intellect as a leader that Haden often displayed, and his affinity for the project comes through a passionate series of performances. Joe Lovano plays with the type of insight and fire that fuels many of his performances, while guitarists Larry Koonse and Lionel Loueke provide some nice foundation material. At every level, Haden was bringing together an all-star cast to intepret some important Mexican music, supercharging the project with exciting potential. The way that this powerhouse ensemble brought compositions from Marroquín, Lara, and Manzanero alive speaks volumes about the leader’s musicality and his ability to dig deep inside the core material for meaning. Haden has long been a proponent of the importance of song, and this project highlights the beauty of each melody within wonderfully simple settings. “Anoranza (Longing)” pairs Rubalcaba with Lopez’s flute, resulting in a gorgeously exposed reading of the melody while the pianist gently creates variations by playing with the harmonic structure. Rodriguez, Lopez, and Haden each take turns playing the melody with very little embellishment over Rubalcaba’s wide open accompaniment on “Cancio De Cuna (Lullaby), before taking solos that unfold with exposed introspection. That’s not to say that the depth of the jazz tradition is missing here – Haden finds space within the music to let his colleagues make personal statements within the recording. After a wonderfully orchestrated melody, Zenón, Rodriguez, and Lovao stretch out on “De Siempre (Forever)” with a subtle forward motion and a jazz tinge. As Lopez, Rodriguez, and Rubalcaba create memorable statements on “Cuando Te Podre Olvidar (When Will I Forget You),” Berroa slides between a straight rhythmic feel and a galloping swing waltz full of character. The music walks an interesting and ultimately very impactful line throughout the album, taking the time to highlight the beauty of the original compositions while letting the musicians make their own mark. Whether you’ve got a passion for Latin Jazz or have a special affinity for Haden, there’s plenty of reasons to revisit Land of the Sun. For many Latin Jazz listeners, the work of Marroquín, Lara, and Mazanero mostly remains a mystery; this recording offers a wonderful opportunity to become familiar with those composers. It’s also an opportunity for many listeners steeped in Afro-Cuban traditions to step away from the pulsating intensity that so often typifies the music and appreciate the aesthetics of the music through a more open environment. Haden’s musical personality stands tall throughout Land of the Sun, offering a unique perspective on the music. As a result, the musicians treat the music with great respect and deliver performances that are at once stripped away of clutter and deeply complex. With this wealth of important Mexican music, exposed performances from some modern greats, and Haden’s experienced musicality running the show, Land of the Sun remains an essential listen that gets better with each repeat performance. Land of the Sun had its genesis in 2003 when Haden met with Marroquin's daughter, Patricia Mendes, after a performance in Austin, Texas. Mendes thanked Haden for recording her late father's song, "Nocturnal," on Nocturne by presenting him with a gift, a folder of her father's compositions. Haden returned home to Los Angeles and was found himself both moved and motivated by the Marroquin material. He called his longtime friend and collaborator Rubalcaba at his home in Coral Springs, Florida and said, "We should do this." Haden sent the Marroquin songs to Rubalcaba, who set to work putting together arrangements. Haden and his wife, singer Ruth Cameron, then traveled to Miami to meet with the great Cuban pianist and begin the project. While Marroquin's songs are recognized as landmarks of Mexico's popular music, pieces such as "Nostalgia" and "Cancion De Cuna" were composed for piano and violin or flute, not jazz improvisation. Haden and Rubalcaba's task was to figure out how to reinterpret the material to suit their mission. "It worried me at first," Haden recalls. "I thought, 'How are we going to do these in a way that the musicians can improvise?' Gonzalo and I worked on it, and he wrote these great arrangements using different flows and different pulses and different tempos." The project received Marroquin's posthumous seal of approval when the composer's grandson, songwriter Criz Sabre, visited Haden and Rubalcaba's early sessions and noted how proud his grandfather would have been. The next step was to begin expanding the musical palette by adding different colors to the mix. "I didn't want this record to be Nocturne II, Haden says. "The songs on Land of the Sun aren't boleros, there are all different kinds of rhythms. With that in mind, I wanted a different musical configuration - I didn't want to have violin on it. Instead, I wanted flute and especially trumpet. I haven't used a trumpet since my first record, Liberation Music Orchestra, and I definitely wanted to have one on this record because it's such a very Mexican sound." Haden and Rubalcaba gathered together a number of musicians, with an ear towards players well versed in Latin jazz. First on their call list was drummer Ignacio Berroa, who had previously joined them on Nocturne. Next, they enlisted an array of talented veterans and newcomers, including flautist Oriente Lopez, trumpeter Michael Rodriguez, alto saxophonist Miguel Zenon, guitarist Lionel Loueke, and the wonderful tenor saxophonist, Joe Lovano. "I'm always looking for different combinations of musicians," Haden says. "I try to bring together musicians that can make magic, and I'm usually right. It's not so much the combination as it is the individual and their values. When I find a musician that has the same values as I do, I want to make music with him." One track - the splendid "Suno Solo Con Tu Amor" - was left unfinished, with space left for guitar to be performed by a player to be named later. As the sessions went on, the recording remained incomplete. While mixing in L. A., Haden realized that the song was too good to be abandoned. "I said to Gonzalo, 'Man, this is such a pretty song, we don't want to lose it,'" Haden says. "I invited Larry Koonse to come over. He played the melody beautifully and improvised a solo, which is what's on the record." While the majority of Land of the Sun takes Marroquin's songs as a template for resourceful musicality, the tender "Anoranza" is performed as originally written by Rubalcaba and Lopez. "They just stayed with the melody," Haden says. "No one improvises at all, and it's really beautiful." In addition to the songs of Jose Sabre Marroquin, Land of the Sun sees Haden and company performing two Mexican popular standards: Armando Manzanero's "Esta Tarde Vi Llover" and Agustin Lara's classic "Solamente Una Vez," a song which has been recorded around the world in five different languages, including English versions performed by both Frank Sinatra and Elvis Presley. The cross-cultural diversity of Land of the Sun points to Haden's avowed commitment to spreading the magic of jazz to a wider audience. "What I try to do is play all kinds of songs from all different categories," Haden says. "Songs that I think are very meaningful and beautiful, with beautiful melodies and great chord structures, in order to attract different kinds of listeners and bring more and more people to the art form. Because we need it now more than ever before. "I want to open jazz up," he continues. "I don't want to keep the audience limited. I want to reach people who have never come to a jazz concert before. One way to do that is by making records that have a lot of different kinds of music on them." Upon finishing the recording, Haden sent an advance copy of Land of the Sun to Patricia Mendes, who expressed the deep feelings Haden's record had brought out in her. "She called me almost in tears," Haden says. "This music is very special for her - one of the songs was written for her when she was a baby, one of the songs her father wrote for her mother." Land of the Sun is a rare work - music that comes from deep within the hearts of those involved resulting in something unique and unprecedented. For Charlie Haden, that instinctive, imaginative approach has been long been his guiding philosophy towards both life and music. "I used to talk to Ornette about creating music in a way that when you play it, it's like you've never played music before," he says. "It's like you're playing for the first time. So every time you play, you're striving to create something that's never been before. "I think we've definitely done that on this record. There's stuff on here that's revolutionary, man. This music has taken on a whole different meaning by being put it into a context of people being inspired by it and creating solos. That's what this art form is about - inspiration. That's what makes somebody play at the top of their form, to play to their full potential. That's how I get my fulfillment, by experiencing people being inspired. It's wonderful for me to be a part of it, to play the bass with it and inspire people through great bass lines, as well as to be able to sit back and enjoy it." Land of the Sun could—perhaps even should—be retitled Bolero: Gonzalo Rubalcaba Presents the Music of José Sabre MarroquÃ-n with Charlie Haden. This recording is about prowess of interpretative melodic dynamics; harmonic, rhythmic, and tonal beauty; and rigorous poetic tenderness. Playing jazzed boleros at this level of musicianship isn't an easy matter nonetheless. One must have disciplined chops, intense sensibility, an openness to the compositions' emotive aim, an all-embracing musical lingo, and the intellectual fortitude to avoid the temptation to under- or overplay. For instance, "¿Cuándo te podré olvidar? begins with Haden stating the melodic nucleus by himself. His waltzing, nostalgic, fat touch ensues a fluid subdued melodic trumpet and flute line as prelude to the first transition—enhanced by a slight sleight of synth-hand by Rubalcaba. Afterwards, flutist Oriente López offers the first solo, packing a breezing, strapping amount of notes in a couple of bars, albeit through fortified economy of expression. Michael RodrÃ-guez does him even better through a flugelhorn statement with plenty of feeling-full technique. Then Rubalcaba merely drops hints of aesthetic pleasure in sparse, genially touched notes. The coda is once again synth touched as if a memory was evanescing. AgustÃ-n Lara's "Solamente una vez is treated through a magisterial traditional jazz trio, with drummer Ignacio Berroa caressing the drums with brushes while the two masters offer a wondrous rendition that, while glacially paced, elicits thoughtful, yet fleeting feelings of miraculous contentment with life as music and vice versa. Curiously, José "Chombo Silva's Los Hits de Manzanero—the only other entire recording featuring a jazz treatment of boleros—also counted upon a distinguished bassist: "Bobby RodrÃ-guez. This Haden/Rubalcaba collaboration, however, supersedes the former in all conceivable respects. De vuelta, personalmente el disco no me gusta aunque sean músicos geniales, pero no por eso lo voy a dejar de compartir.